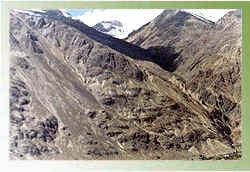 Leh, Leh Ladakh, Leh Ladakh Tours, Leh Ladakh Travel, Ladakh Tourism,Ladakh Tour, Leh Ladakh Travel Tour,Ladakh Trekking Leh India. Leh only became regio nal capital in the 17th century, when Sengge Namgyal shifted his court here from Shey, 15-km southeast, to be closer to the head of the Khardung La-Karakoram corridor into China. The move paid off: with in a generation, the town had blossomed into one of the busiest markets on the Silk Road. During the 1920s and 1930s, the broad bazaar that broad bazaar that still forms its heart received more than a dozen pony- and camel-trains each day. Leh's prosperity, m anaged mainly by the Sunni Muslim merchants whose descendants live in its labyrinthine old quarter, came to an abrupt end with the closure of the Chinese border in the 1950's. One after the Indo-Pak wars of 1965 and 1971, when India rediscovered the hitherto forgotten capital's strategic value, did its fortunes begin to look up. Today, Khaki-clad Jawans (soldiers) and their families from the nearby military and air force bases are the mainstay of the local economy in winter, when foreign visitors are few and far between. Undoubtedly the most radical shake-up, however, ensued from the Indian government's decision in 1974 to open Ladakh to foreign tourists. From the start, Leh bore the brunt of the annual invasion, as busloads of backpackers poured up the road Srinagar. Twenty or so years on, though the main approach is now via Himachal Pradesh rather than Kashmir, the summer influx shows no sign of abating. Leh is doubled in size and is a far cry from the sleepy Himalayan town of the early 1970's. During July and August tourists stroll shoulder to shoulder down its main street, most of whose old style outfitters and provision stores have been squeezed out by Kashmiri handicraft shops, art emporiums and Tibetan restaurants. Leh has nonetheless retained a more tranquil side, and is a pleasant place to unwind after a long bus journey. Attractions in and around the town itself include the former Palace and Namgyal Tsemo Gompa, perched amid strings of prayer flags above the narrow dusty streets of the Old Quarter. A short walk north across the fields, the small monastery of Sankar harbours accomplished modern Tantric murals and a thousand beaded Avalokitesvara (also spelt as Avalokiteshvara) deity. Leh is also a good base for longer day trips out into the Indus Valley. Among the string of picturesque villages and Gompas within reach by bus are Shey, site of a derelict 17th century palace, and the Spectacular Tikse Gompa. Until one has adjusted to the altitude, however, the Only sightseeing one will probably feel up to will be from a guesthouse roof terrace or garden, from where the snowy summits of the majestic Stok-Kangri massif (6,120m), magnified in the crystal clear Ladakhi sunshine, look close enough to touch. 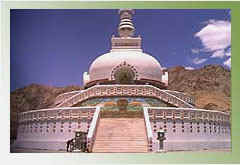 This is small but more interesting place to visit than the Leh Gompa and can easily be visited on foot. 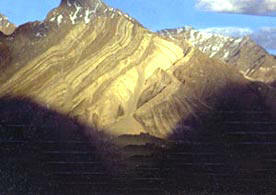 The Sankar Gompa is an under Gompa of Spitok Gompa. At the most only 20 monks live here and few are permanently in residence although the monastery itself is fairly active. Thus the Gompa is only open to the public from 7.00 am to 10.00 am and from 5.00 to 7.00 pm. It is, however, well lit, so an evening visit is worthwhile. At these times the monks will welcome the visitors and may offer one yak butter tea, 'Tsampa' and boiled and spiced mustard plant. The old palace of the kings of Ladakh overlooks the town from the southwest slope of the Tsemo hill. It has eight storeys and was built by King Sengge Namgyal in the 16th century, at much the same time as the famed Potala of Lhasa - which it resembles. The damage to the palace, one side is gaping open, stems from the Kashmiri invasions of the last century. 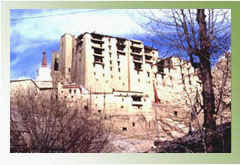 Like the Shey palace the Leh palace still belongs to the Ladakhi royal family, who now live in their palace in Stok.